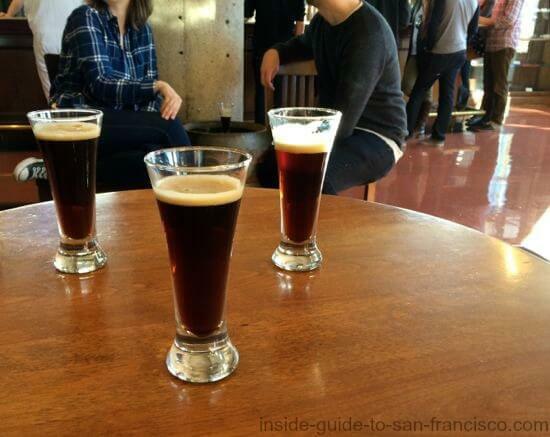 Treat yourself to a tour and tasting at San Francisco's oldest traditional brewery. This is a really fun San Francisco thing to do. 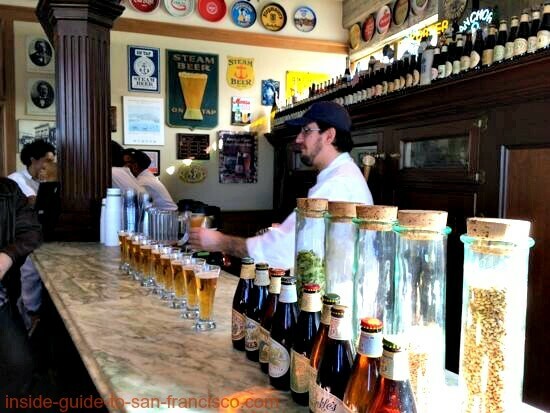 The charming Anchor Steam Brewery hosts tours twice a day and escorts you through the three floors of their operation, finishing off with an opportunity to taste about 7 of their beer varieties. The Anchor Steam Brewery goes all the way back to the Gold Rush era, when founder Gottlieb Brekle arrived in San Francisco. Founded by German immigrants in 1896, this brewery still makes its beer in essentially the same way as it was done in the old country a hundred years ago. 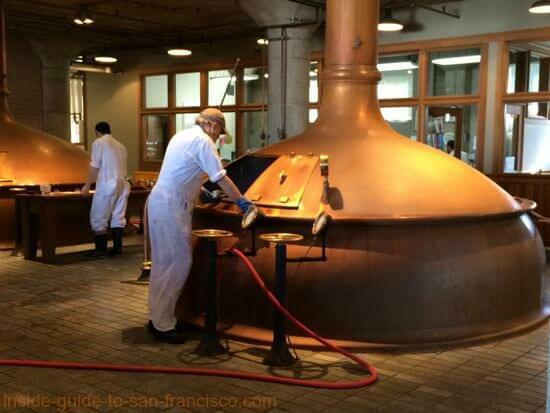 The tour guide fills you in on the turbulent history of Anchor Steam in San Francisco, while taking you through all the stages of the beer-making process. This is one of the original "artisanal" breweries, existing long before microbreweries became trendy. 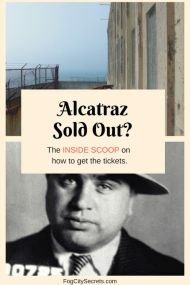 It had such a rocky history, it's almost a miracle it's still here: owners run over by street cars, building destroyed in the 1906 earthquake, shut down for 13 years during Prohibition, etc.! It almost went under again when American tastes shifted to cans of Budweiser and Pabst Blue Ribbon, but it came back big time in the 1970's, when a demand for flavor and variety reappeared. Their brewing process is very natural one. Only four ingredients go into their beers; malted barley, hops, water and yeast (with some malted wheat added to their wheat beers). 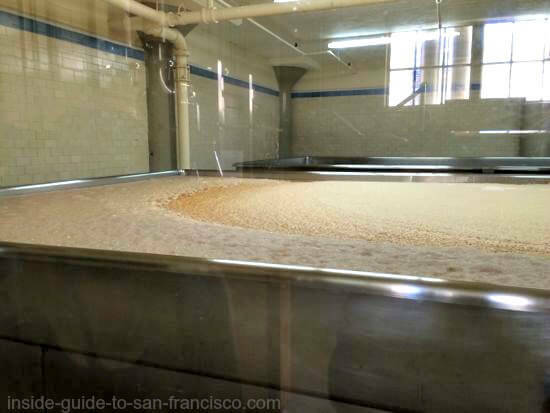 The cooling of the boiling malt and hops mixture is done by the cool, San Francisco air (hence "steam beer", as the steam rises from the cooling tanks). The brewery is small and has a friendly, family feel to it. You tag along behind the guide, up and down stairs, peering at vats of soupy malt, sacks of feathery hops and beautiful copper kettles boiling the mixture. Even their office has old-fashioned wooden desks and bookcases, transporting you back to the 1940's. 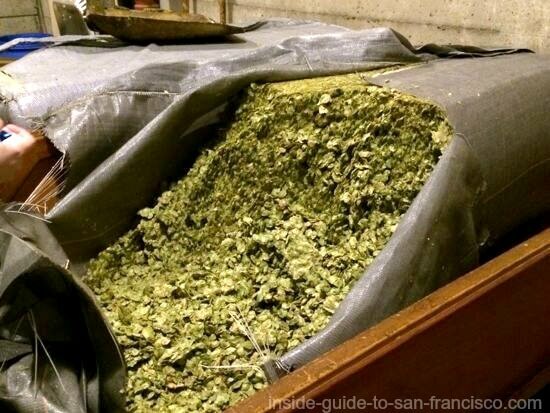 Only the dried flowers of the female hops plant are used. And then the grand finale. Back to the cozy taproom to taste about 7 of their varied brews. Note the size of the "tastes"
They are generous with their tastings. And there is no rushing you out the door. We found it very relaxing and hung out there probably an hour or more after the tour. Reservations are required (make them online through their website www.anchorbrewing.com). Children can go on the tours, but you have to be 21 to taste. You have to go on the tour to do the tasting. Monday Through Friday: tours at 11:00 a.m. and 1:30 p.m.
Saturday & Sunday: tours at 11:00 a.m., 1:30 p.m., and 4:00 p.m.
$25 per person (21+). Under 21 are free. The tour lasts about one and a half hours (including tasting). Up to four people in a party. Tours by reservation only. But it's much easier to get tickets now that they charge for the tours. It was tough to get in when they were free. The tour involves a fair amount of walking and stairs, but there are elevators available for those with mobility problems or using wheelchairs. They've added a distillery and now have tastings (separate event) for that as well. See below. Anchor Steam has a stable of current beers, some year-round and others produced seasonally and available for just a few months a year. In addition, they produce some interesting, one-time, specialty beers from time to time, like Sumerian Beer (based on a 4000-year-old recipe) and Earthquake Beer, after the 1989 quake. 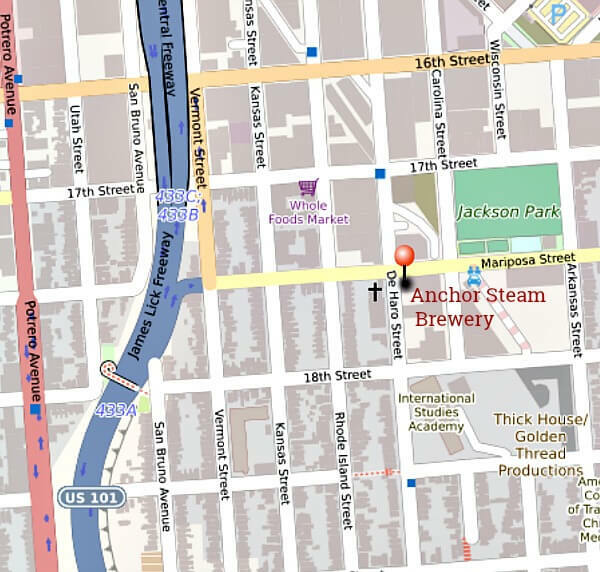 There is a good description of each of the beers on their website and a nifty search system to find out which stores and bars nationwide sell Anchor Steam beer, and precisely which versions are available at each location: Anchor Steam Beers. 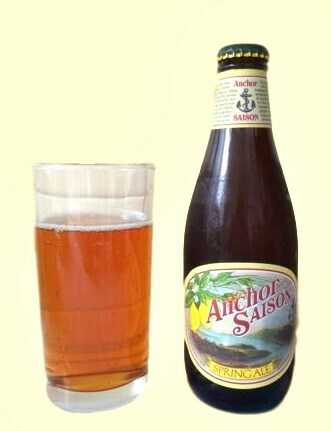 I tried their Anchor Saison Spring Ale, available in February, March and April each year. It's a Belgian-style ale made with a type of yeast that gives it what they describe as a peppery flavor, plus they add in an interesting mixture of ginger, lemongrass and lemon peel. Has a refreshing bite to it, very nice. In August, 2017, Anchor Steam was purchased by the Japanese beer company, Sapporo. At present, there are no plans to move the brewery from its current location, or change its traditional brewing process, as long as it can keep up with the demand (according to the new owners). 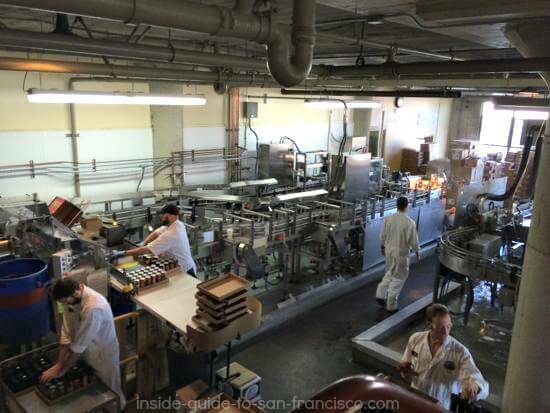 But who knows what the future holds for Anchor Steam? Now is a good time to visit! The plan for the big expansion of the brewery at Pier 48 seems to have disappeared following the sale. 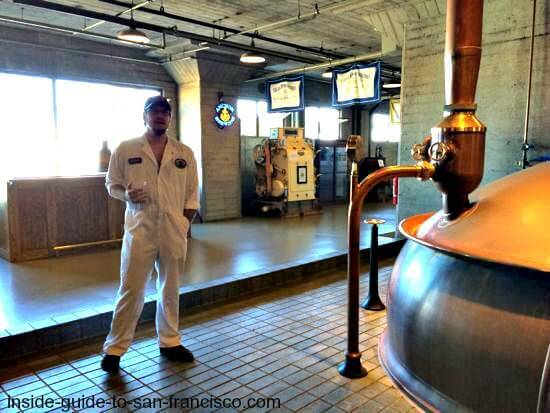 Anchor Steam also has a distillery and it's now open for tastings (in the same building as the brewery). The Distillery was not included in the sale to Sapporo, and will become a separate company. A one-hour tasting costs $35, and includes tastes of six of Anchor Steam's own gin, vodka and whiskey creations. Reservations recommended. See Anchor Distilling for more info and booking. Anchor Steam has opened a pub next door, Anchor Public Taps, serving many of their beers on tap, plus some new ones brewed on the premises. It's a congenial place to hang out and try their beers. Food trucks supply the food, and dogs can visit on the patio. Open daily 11:00 a.m. to 9:00 p.m. 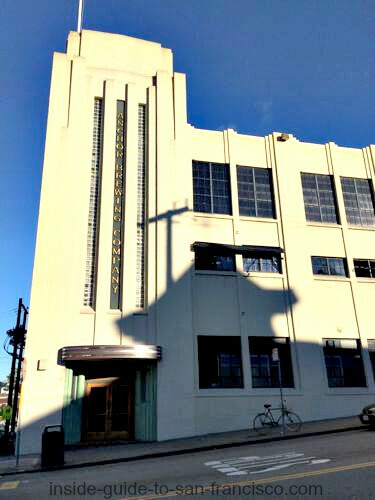 The Anchor Steam Brewery (and Distillery) is located at 1705 Mariposa Street, in the Potrero Hill neighborhood. The entrance is on De Haro Street, at the corner of Mariposa. There is no parking lot, but you can park on the street. You may have to walk a block or two. Even though it's in a totally different part of San Francisco, it's actually pretty easy to get over there from either Fisherman's Wharf or Union Square. The 19 Bus will take you within one block of the brewery. Get off at Rhode Island Street and Mariposa Street, then walk one block downhill (east) along Mariposa Street to the brewery at the corner of Mariposa and De Haro Streets. From Union Square, walk down Powell Street to Market Street and take the Muni Streetcar (underground) one stop to Civic Center. Go back up to Market Street and catch the 19-Polk/Hunter's Point Bus at Market and 8th Street (where the Civic Center stop is). Follow directions above. 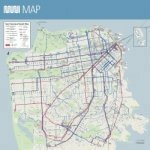 Here's a link to the Muni 19-Polk map and schedule. 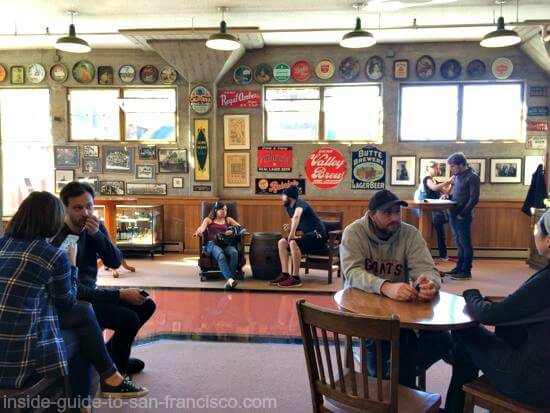 Spend 5 hours visiting three of SF's small breweries and brewpubs, in three very different neighborhoods, tasting the beers and enjoying the food pairings. Get a taste, and a close-up view, of the South of Market area, the Haight-Ashbury neighborhood, and the Mission District. Hotel pick-up included. See Beer & Bites Adventure for more info and booking. $9 off if booked online.